One of the great challenges for travelers during the Depression era was locating a clean, family style restaurant, with ample parking, quality food and low prices. Into this void stepped Howard Deering Johnson of Quincy who ultimately operated a nation-wide chain of restaurants geared towards the family traveler, one of which was located between 1935 and 1944 on Route 28 near the Middleborough Rotary location of the present Dunkin’ Donuts. 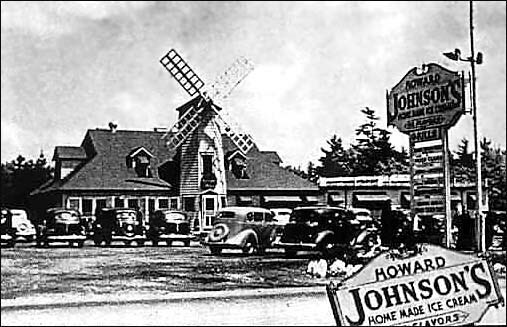 In 1935, Howard Johnson’s acquired the Rotary Mill restaurant in Middleborough previously operated by George Manning of Mattapoisett. The Rotary Mill, which had been built shortly after the 1932 construction of the Middleborough Rotary and operated for just a few years, was noted for the distinctiveness of its Colonial Revival architecture, particularly the mock three-story windmill which served as the restaurant’s entrance and stood as a landmark on the route to the Cape for summer travelers. 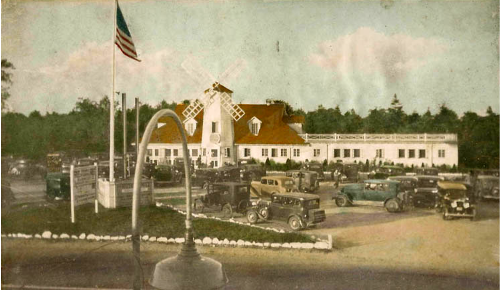 Following its acquisition by Howard Johnson’s, little change was made to the exterior appearance of the Rotary Mill, whose architectural style was very much compatible with that of the other early Colonial Revival style Howard Johnson restaurants designed by Joseph G. Morgan. One notable change, however, was the addition of the distinctive orange baked-enamel roof, an easily recognized beacon for travelers in search of convenient dining. Howard Johnson’s early slogan was a “Landmark for Hungry Americans”, and the ubiquitous orange roof helped them in their search. The opening of Howard Johnson’s new Middleborough location on September 22, 1935, was advertised with discounted ice cream and “our delicious frankforts roasted in pure creamery butter.” These two favorites, along with others such as clam strips and macaroni and cheese would become Howard Johnson staples, so much so that they were later marketed in supermarkets. Like the other restaurants in the Howard Johnson chain, the Rotary Mill served Johnson’s exceedingly rich ice cream (19 per cent butter fat content), with generous servings from distinctively-shaped scoops. Ice cream was made in 28 flavors, and woe to those who opted for lowly vanilla. "We spend our lives developing 28 flavors, and they still come in and say 'Make mine vanilla! '” Johnson once fulminated. Like ice cream, the simple hot dog was yet another roadside staple which Howard Johnson early elevated to a specialty. In Howard Johnson restaurants, hot dogs were called “frankforts” and were grilled in butter, diagonal scores being cut along the hot dog in order for them to soak in more of the butter in which they were grilled, and served in grilled rectangular buns. Clam strips became another recognizably Howard Johnson’s meal, and were harvested from beds owned by the company off Ipswich. While undoubtedly many Middleborough residents dined at the Rotary Mill, Howard Johnson’s restaurants were geared to the traveler. Diners stopping at a Howard Johnson’s clearly knew what to expect in contrast to local restaurants and roadside stands, the quality and cleanliness of which could vary greatly. Eventually, World War II with its gasoline, tire, rubber and food rationing crippled the roadside restaurant business. In 1944, Howard Johnson’s converted its Rotary Mill restaurant to a Red Coach Grill, then a new dining concept embraced by the company. The view depicts the Rotary Mill as seen from across Route 28 shortly after its acquisition by Howard Johnson's. The most noticeable alteration undertaken at the time was the application of the chain's distinctive orange enamel roof, an easily recognizable feature for travellers in search of clean, inexpensive and reliable family-friendly dining options. This view was utilized to advertise the local Howard Johnson's which was replaced in 1944 by the Red Coach Grill, a new dining concept promoted by Howard Johnson's in an effort to attract a more local clientele.